The mono-comfort handlebar, standard on all new 6 Series models, is height-adjustable and can be easily folded over for compact storage and transport. It also makes it much easier to access and empty the grass catcher box thanks to the innovative, single handle design. 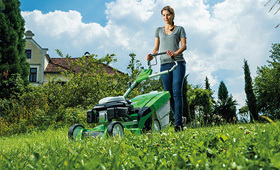 All controls are within easy reach, setting mower speed has never been so easy. The six models in the 6 Series range are available in two cutting widths and different drive types to make mowing quick and easy. All the lawn mowers are 3-in-1 multi-mowers and are equipped with a mulching plug and a special multi-blade for collecting, cutting and dropping or mulching as required.